Basket, American China Manufactory, Philadelphia, 1770–72 , soft-paste porcelain, Yale University Art Gallery. Points of encounter can occur across time and space. In colonial Mexico, blue and white earthenware vessels made in the city of Puebla responded to East Asian hard-paste porcelain. At the same time, ceramic manufacturers in China adapted designs that catered to pan-American tastes, and both John Bartlam’s South Carolina pottery and the American China Manufactory in Philadelphia produced their own soft-paste porcelain wares on the eve of the American Revolution. More recently, Carrie Mae Weems’s The Hampton Project reexamined a nineteenth-century vocational school that served as a cultural crossroads for formerly enslaved African Americans, American Indians, and white Americans to raise pressing questions of race, imperialism, and nationalism in the twenty-first century. These points of convergence between individuals, groups, places, and objects often instigate shifts in creative production with lasting and global resonances. The interaction of disparate cultures offers a rich nexus for artistic creation. Yet such encounters are also inseparable from the shifting dynamics of power that operate along gendered, racial, economic, and political lines. What can exchanges and entanglements reveal about the nature of encounter? How do encounters shape exchanges? In what ways do exchanges propagate new encounters? The Fifteenth Annual Yale University American Art Graduate Student Symposium invites papers that interrogate the dialectical relationship between encounter and exchange and explore the legacies of cultural intersection. We invite submissions that address art across North, Central, and South America and the Caribbean, that engage a range of critical perspectives, and that speak to a variety of time periods and artistic practices. Interested participants are invited to submit an abstract of no more than 350 words along with a CV to americanist.symposium@gmail.com by 1 February 2019. Accepted participants will be notified in mid-February. Accommodations will be provided for all graduate student speakers in New Haven, Connecticut. Today’s guest poster is Bryan Rindfleisch, Assistant Professor of History at Marquette University. 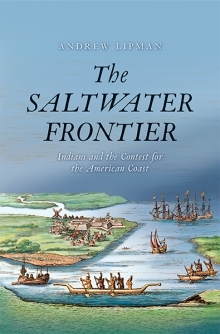 Andrew Lipman, The Saltwater Frontier: Indians and the Contest for the American Coast (New Haven: Yale University Press, 2015). In designing courses, professors and teachers face a number of competing claims for time and attention: skill development appropriate to the level of the course, the content described in the course catalog, campus, system, or state requirements for content, the primary sources and scholarship that will promote the best discussions and consideration of the course topic. As many of us have written here at the Junto, not to mention elsewhere, much therefore ends up on the cutting room floor—and some of it painfully so. Welcome to the second installment of the Junto Summer Book Club! We discussed the introduction and first chapter of Kathleen Brown’s Good Wives, Nasty Wenches, and Anxious Patriarchs during Week 1. This week we’ll consider Chapters 2 and 3. With these chapters, Brown transports us across the Atlantic Ocean, shifting her focus from early modern Britain to the early years of English settlement in Virginia. Many months ago, I posted the first of what I hoped to be a quarterly series highlighting recent articles I enjoyed, and inviting readers to do the same. Sadly, life got in the way, and so I have a bit to make up. As a recap for this roundup’s purpose: there are so many journals publishing quality articles in the field of early American history that it is difficult, if not impossible, to keep up. So this list serves as a reminder that you need to catch up on new issues, a identify articles I found especially important, as well as a chance to highlight the work of young scholars and friends. Just because an article doesn’t make the list doesn’t mean I didn’t like it—in fact, I am way behind on my own reading—but it is an invitation to list your own favorite recent articles in the comments below.